10,000 FB Followers Nail Giveaway ♥ SIXTEEN WINNERS! I've been planning this giveaway for a long time and I must say that it's easily my best one yet. In fact, it's better than all my past ones combined! TEN sponsors, SIXTEEN winners & countless nail polishes, jewelley and supplies up for grabs. Before I continue, though, I want to say a huge thank you to everyone that has sponsored this giveaway. I had such a fantastic response - there's at least $500 NZ worth of nail-related goodies here. There are such generous people in the nail community! While you're scrolling through the prizes, racing to enter, please stop check out each of the sponsor's Facebook pages, which will be linked below each picture. These are the people that made this giveaway happen ☺. A couple of things to be aware of - please read! There are TWO giveaways on this page - one for everyone (international) and one for New Zealanders only. You can enter these giveaways through the Rafflecopter widgets - and since there are two giveaways there are two widgets. After the first 12 pictures of prizes there is the first one, where anyone can enter. At the very bottom of the post (after the last four prize pictures) there is the second, New Zealand-only one. If you're not in New Zealand please don't enter through that one, but go ahead and enter the first! New Zealanders can enter both giveaways. Sorry if it sounds confusing, but it's quite important! More details on how to enter will be further down, but now it's time to introduce the prizes! Feel free to share these pictures, the link and the excitement anywhere you want! 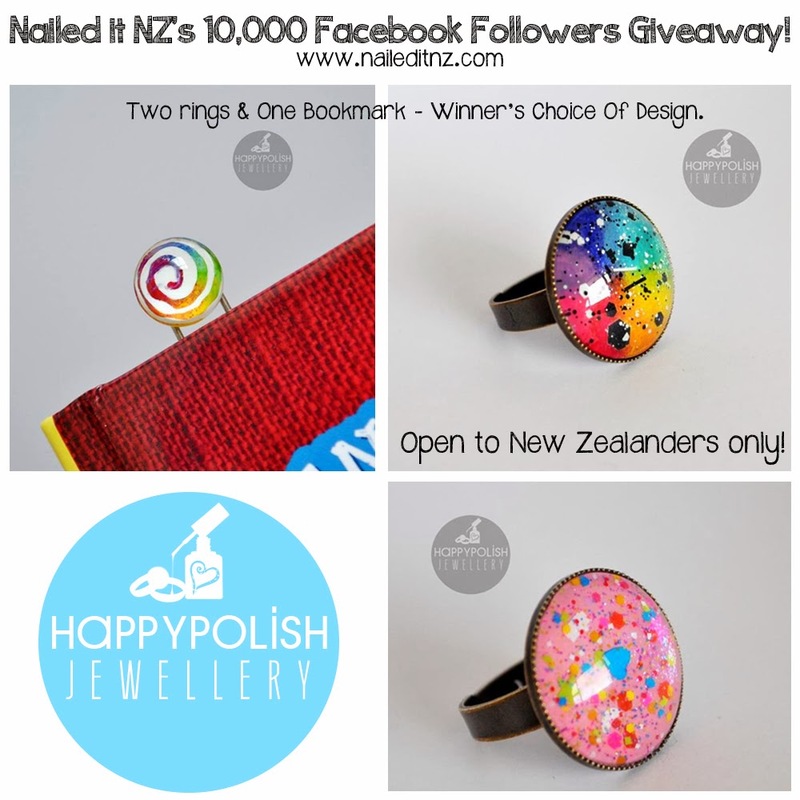 Happy Polish Jewellery - Two Rings and a Bookmark of the Winner's Choice. Alter Ego Nail Enamel - Two Polishes of the Winner's Choice. Harlow & Co. - $50 voucher. 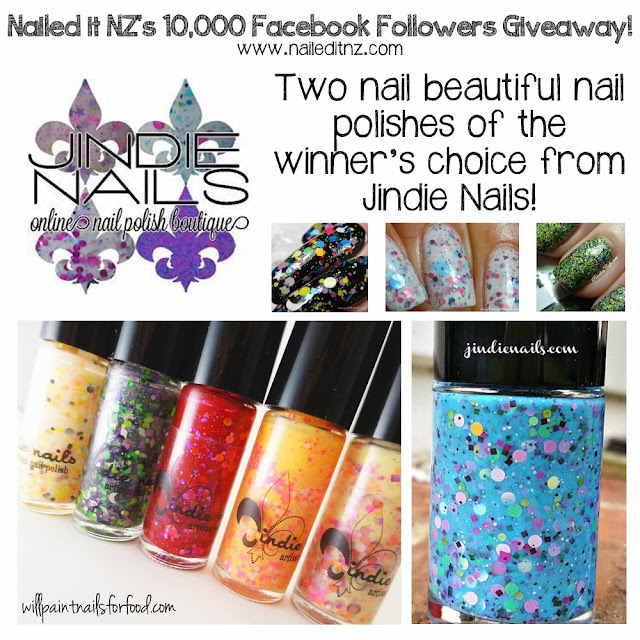 Jindie Nails - Two Polishes of the Winner's Choice. Enter the international giveaway here! Enter here for a chance to win one of the twelve prizes above! Open internationally - anyone from any country can enter. In case you're unfamiliar with Rafflecopter giveaways, this is how to enter; You can get up to 39 entries, each entry gained by doing certain things - that are normally worth one entry each but some are worth up to five. There is one mandatory option - you must give me your email address so I can contact you. The rest you can pick and choose from, but remember it's best to do every option possible! Give yourself the best chance of winning! Any questions, just ask in the comments. NO CHEATING! I'll discard any winners that have won by saying they did something they didn't. Here's the button that gives you an extra five entries. 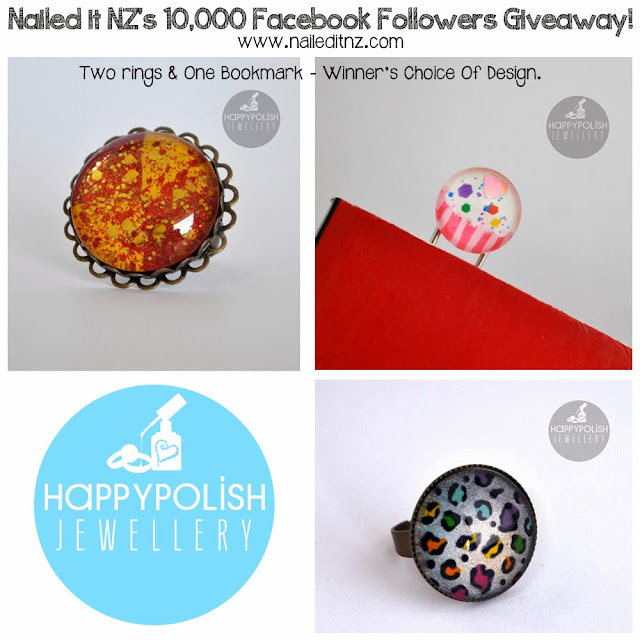 The next four prizes are for New Zealanders only - only enter the next widget if you're from NZ! If I draw a winner who is not from NZ I'll have to re-draw. Kiwis, you can enter the international one as well :). 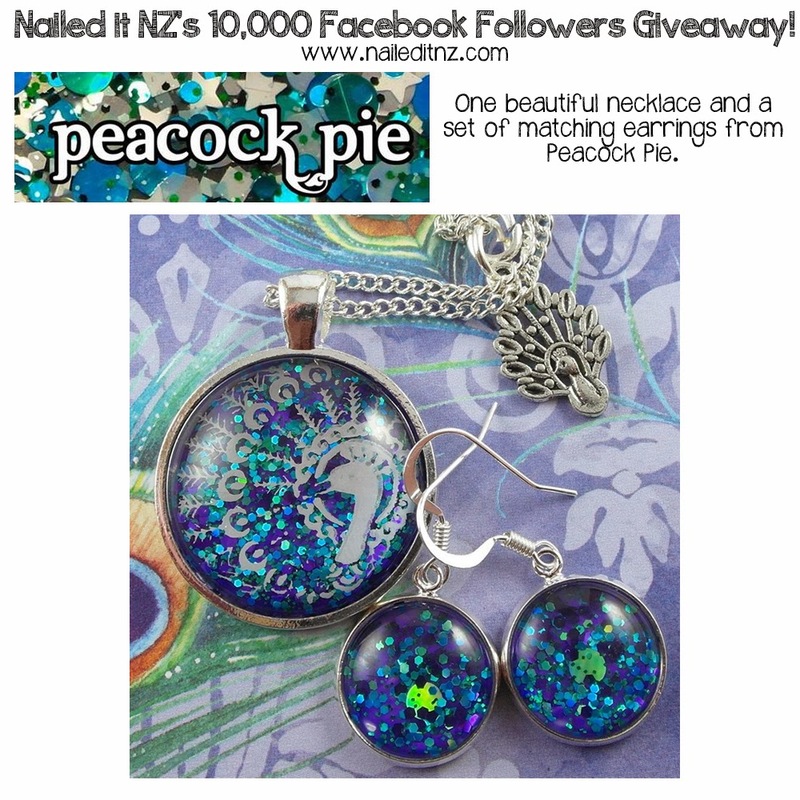 Enter the New Zealand-only Giveaway Here! 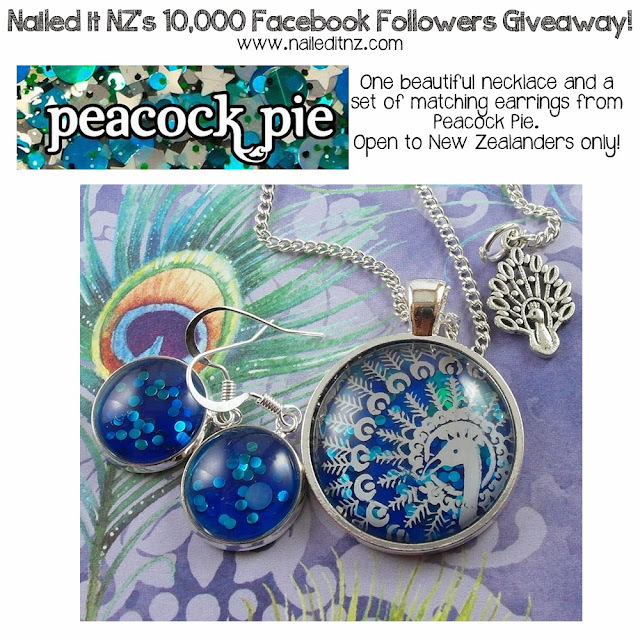 New Zealanders, enter here to win one of the four prizes above! You can get a maximum of 26 entries for this one. Remember, you can also enter the international one! I must note that we can't afford to replace anything lost through shipping - but we'll try our very best to make sure this doesn't happen! If you have any questions, feel free to ask in the comments or on my Facebook page. I would love to win the Harlow & Co. Thanks! LOVE LOVE LOVE the giveaway! It would be amazing to win the Harlow & Co. voucher! I love all of these things!! I especially love the Peacock Pie jewellery though! 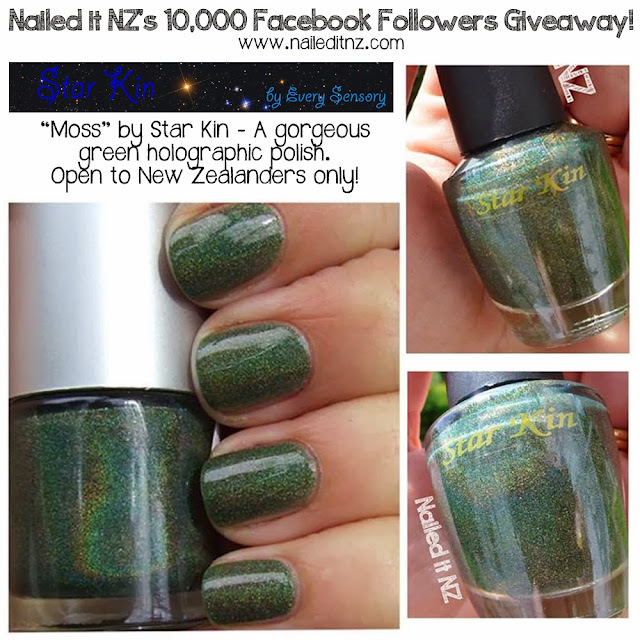 And from the NZ only giveaway, I LOVE the look of the gold flake polish! So pretty! epic epic epic jessie!!! this is awesome!!!! Congrats on your great milestone of 10,000 followers! That is most awesome! All of these are great prizes. I think I would be most exited to win the $50 voucher, but any would be nice. Good luck everyone! Congrats on the milestone! I've got my eye on either the Literary Lacquers collection or #1 or #2 of Alice's kits. One can never have enough art supplies! Congrats on 10,000 followers! There are some amazing prizes- crossing my fingers that I win the Harlow & Co. gift card so I could try out some indie brands! Congrats on 10,000 followers! These are some amazing prizes- crossing my fingers for that Harlow & Co. gift card, so I could finally try out some indie brands! Forgot to answer the question of what I want most: Any and all of the nail polish! So many pretty colours. :) And the dotting tools, and the striping tape, and... oh dear, choosing just one thing is actually really hard. All the prizes are amazing! I'd most like to win the Harlow & Co voucher. Thank you so much for the opportunity! Most of all, I would like the Literary Lacquers collection! Congratulations on reaching such a milestone! :) Also, I would love to win the gift voucher for Harlow and Co. I think what you're uber generous to put on this giveaway. Congratulations on reaching a massive milestone of 10,000 FB likes! I can't believe there will be 16 winners, the prizes are all fabulous <3 Fingers are crossed!! Congratulations for hitting such a huge milestone! And thank you for the international giveaway! :D My would love to win Literary Lacquers! Haven't tried her polishes before. This would be a great chance to (if I win, plus the colours looks great!). I've been loving the countdown to this giveaway and now it's here! Really want the literary lacquers, or the harlowe and co voucher! Thanks for organising SUCH an awesome giveaway! not sure my comment posted, so sorry if there is two! I'd love to win the literary lacquers, or the zoyas! An amazing giveaway! Congratulations for the 10k FB Followers! I'd love the Community Collection from Literary Lacquers. Thank you! I would love the Harlow & Co voucher or the Jindie Nails or Alter Ego polishes, as I can't find anything so gorgeous where I live! I want the Zoya one! Holy balls I'd love any of the prizes! Thanks for a wicked giveaway Jessie, and congrats on 10k followers!! 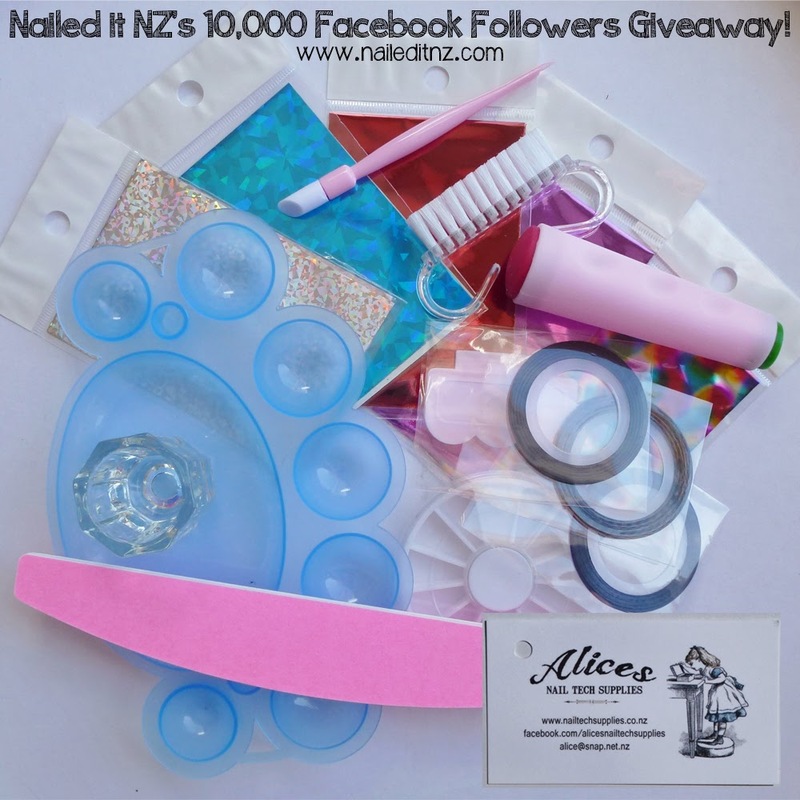 For the NZ only giveaway I want to win the Zoya Gilty Pleasures pack sooooooooooooooooo bad!!! Any of the prizes would be really cool to win! I'm most excited about the Harlow and Co prize, I've been drooling over her indie selection for weeks! Congratulations on all the Facebook followers! Thanks for putting this giveaway together for so many people! 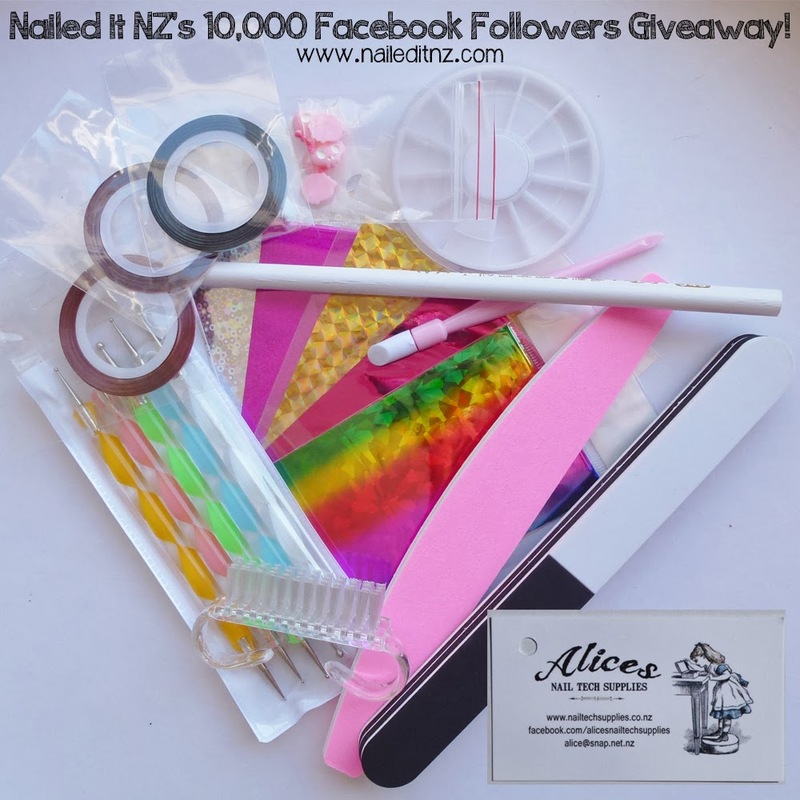 I would love to win one of the prize packs from Alice's nail tech supplies! 10000 followers! This time last year I'd just discovered your blog. Unreal how things change. Loving this massive giveaway it's so exciting. 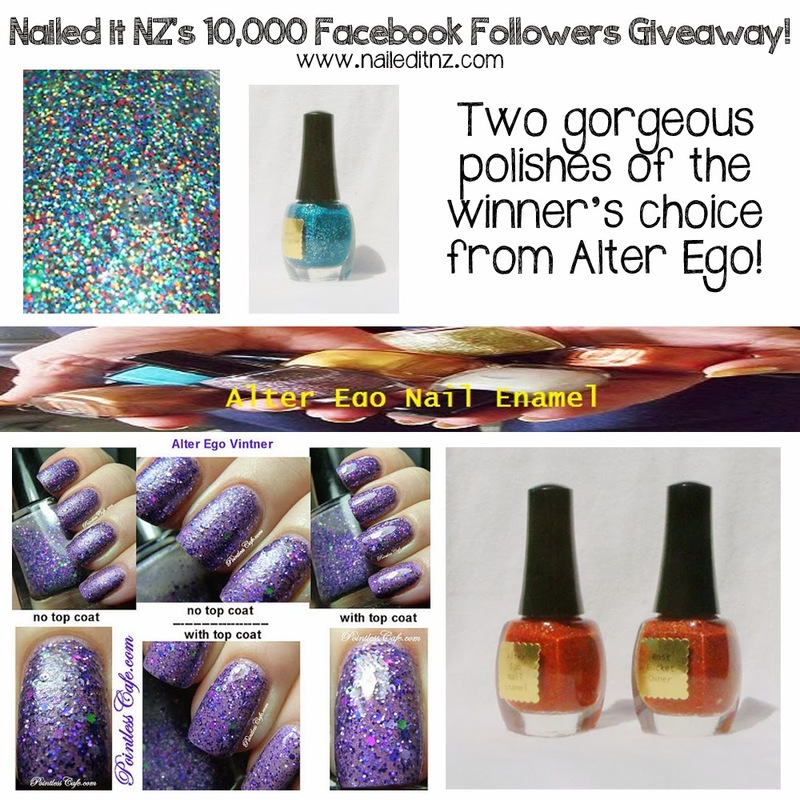 I would really like to win either Literary Lacquer or $50 Harlow & Co voucher! Thank you so much for this AWESOME giveaway! I'd love to win all the sets :P but I've to chose one of them.. so my favourite one is Harlow & Co. - $50 voucher!!! I would love love love to win the Literary Lacquers prize pack! Those polishes are stunning! Of course, I'd be excited to win any of the prizes. My favourite is Harlow & Co. - $50 voucher! I would love to win the Literary Lacquers prize!!!! :) Sooooo gorgeous! I've discovered your blog thanks to this awesome giveaway! I would love to win any of them. They are all awesome!! That Harlow & Co voucher would go down a treat! Thank you for the opportunity to win with this amazing giveaway!! Amazing giveaway, thank you! I love any prize! I think the Giveaway is awesome and I'd be happy with any prize. I'm a big fan of Harlow & Co, though, so the voucher would be my dream come true! Harlow & Co voucher would be nice and the Literary Lacquers collection is such a great prize as well. I am hoping for those Literary Lacquers lovelies! I am hoping for the Literary Lacquers prize! Such a cool giveaway! The giftcard from Harlow & Co would be sick! Such a cool giveaway! The Harlow & Co voucher would be sick to win!! Epic giveaway, congrats on 10k! I think the giveaway is awesome and terribly generous of you and your sponsors. I would love the jindie nails, nail polish, have been drooling over this polish for ages now! Probably the Jindies since I don't own them, or the Harlow gift certificate. 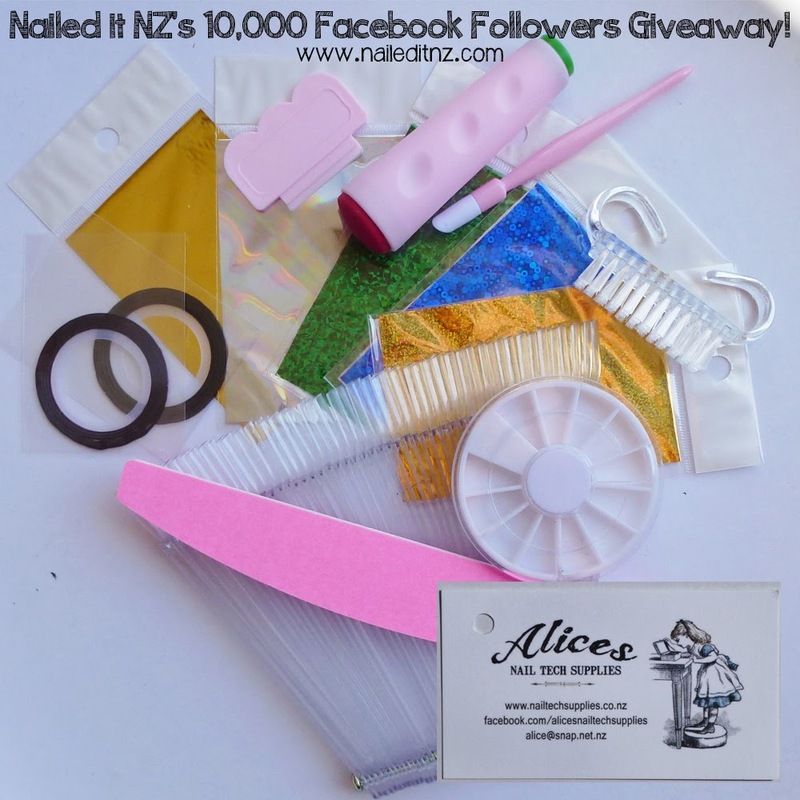 The giveaway is fab! I'd LOVE to win the Literary Lacquers, they're such gorgeous polishes!! I would love to win any of the prizes! Thanks for the chance and congrats! I would love any of the prizes but especially the literary lacquers! Thanks for hosting such a great giveaway! They all are great prizes but if I had to pick it would be #1 for the dotting tools and foils. Literary Lacquers prize or Harlow & Co! great prizes Id be tickled to win any of them!!!! Id be tickled to win any of these prizes!!!! Aaaa! I so want The Community Collection! I think the giveaway is awesome! I would love to win the Harlow & Co.
Amazing giveaway! Would love the Literary Lacquers polishes. The Harlow & Co gift card sounds awesome. 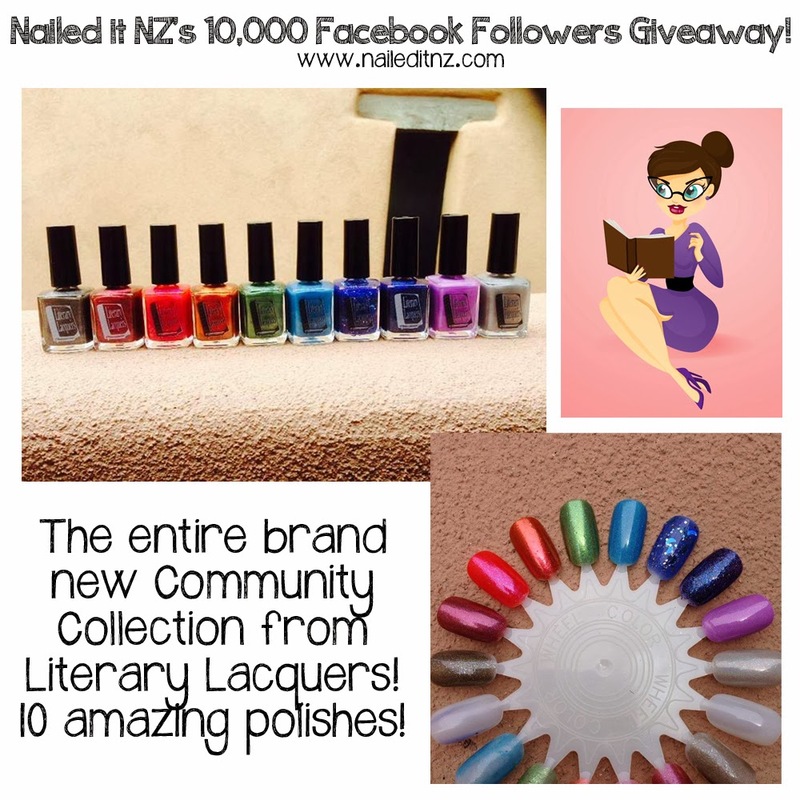 Literary Lacquers Community collection is beautiful!! Awesome giveaway! I'd be lucky to get any prize. 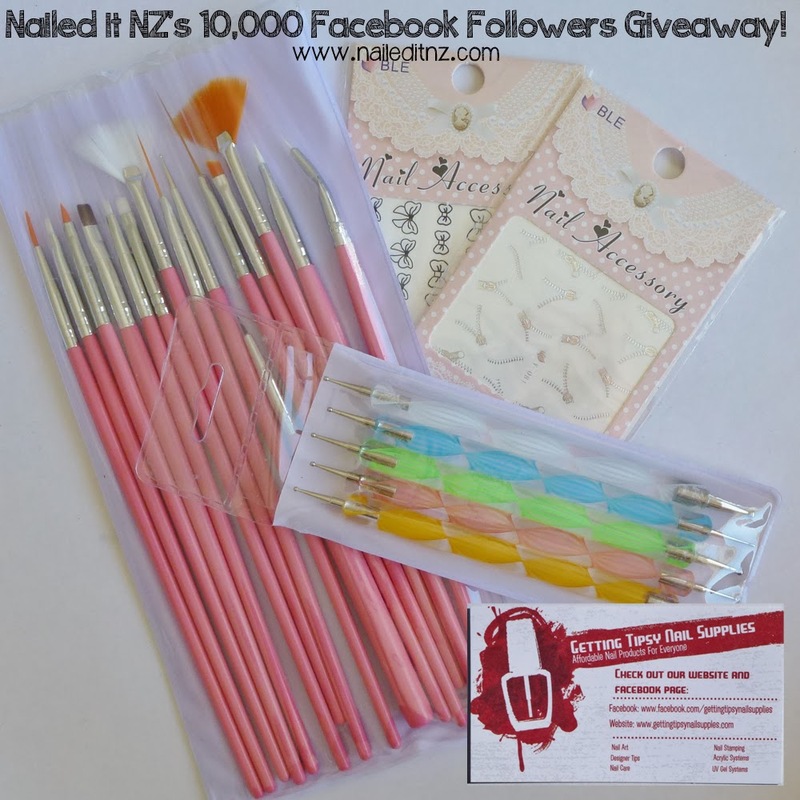 I would LOVE to win the nail art brushes/dotters!! 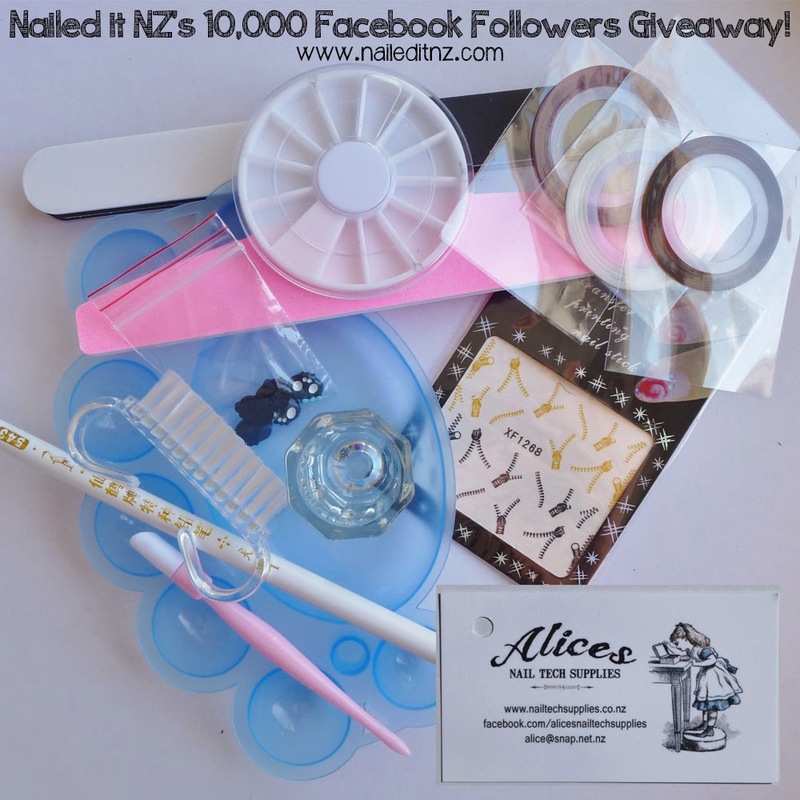 awesome giveaway, would love to win the the voucher to Harlow & Co! This is such a great giveaway! I really hope to win something!! By the way I love your tutorials on youtube! They're fantastic! I`d love to win the voucher Harlow&Co! I would most like to win the Harlow & Co voucher. This is a fabulous giveaway. Congrats on 10k! I could swear I've already commented! Lol I would love the Literacy Lacquers price! It's polish inspired by books! What's not to love?? Congrats on the 10K! I'd love the Literary Lacquers prize! Their polishes look so beautiful, and I'd love to post reviews about them all on my own blog! Such an awesome giveaway! I'd love the $50 voucher to Harlow and Co. That way I could purchase polish from a few different Indie makers to see which one I like best so that I know which to buy again! Thx so much for hosting this giveaway!! I really love the 'Getting Tipsy Nail Supply', so cute!! Wow, congrats on 10k! The giveaway is fantastic. I'd love the community colors collection - Amy's polishes are one of my favourites! $50 to harlow & co!! 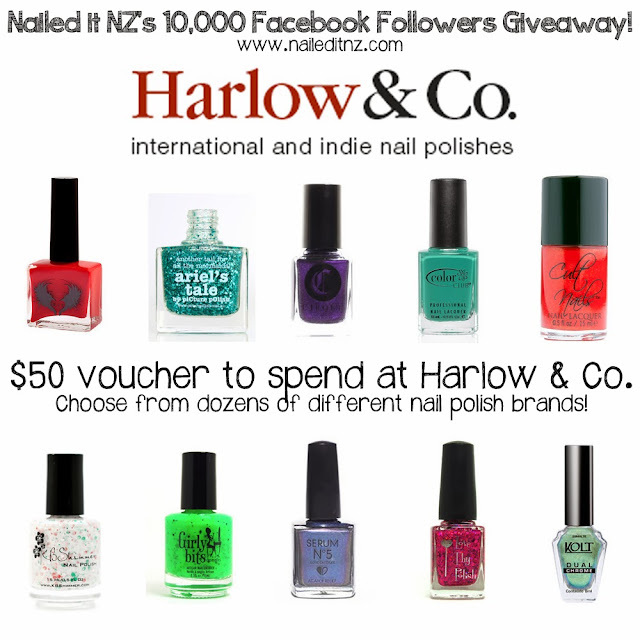 i'd LOVE the $50 voucher to Harlow and Co! Thanks for the giveaway!! GREAT giveaway!!! I would love to win the Literary Lacquers prize. I just got my first 2 polishes from her and they are amazing! What an incredible giveaway! My favourite prize is the Harlow & Co voucher, but I would be grateful to win any one of the packs, they all look stunning! I would LOVE the Gilty Pleasures prize pack! 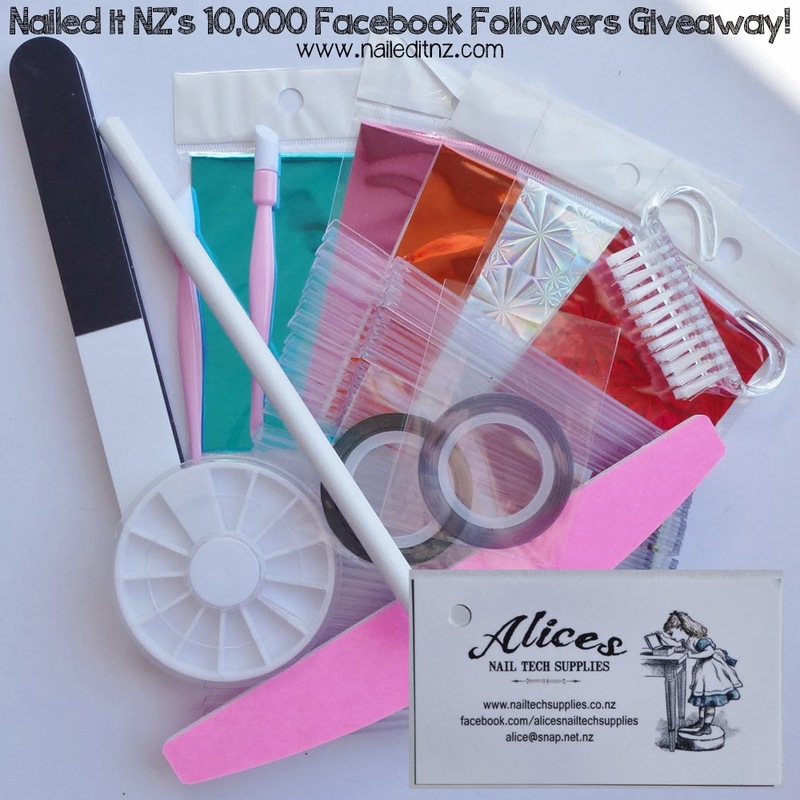 Good on you Nailed It Nz for an amazing giveaway for just Kiwis! Wow. I think I'd like to win the Jindie pack, or the Zoya one. Fantastic give away (I can't see my previous comment!). What a big effort, and all those followers!